There’s no homicide epidemic at all. We are at a historically low plateau of homicide, and when the media trots out it’s “30,000 gun deaths per year” number, they do everything they can to hide the fact that 20,000 of those are suicides, and seven eights of those gun suicides are men. The “gun deaths” problem is actually not much more than a symptom of a larger “men’s health” problem. But nobody knows this, because nobody’s going to march on Washington for men’s health. The feminists certainly won’t do it, because it doesn’t match their privilege narrative, and the men aren’t going to do it because they’d look like crybabies. Which may in fact be related to the suicide thing, in a “toxic masculinity” kind of way. But that’s a different story, for another day. The story today, is not about homicide, or suicide, or even about guns at all. It’s about the profound reason why nobody knows these true things. The whole article is a good read, but I’m not convinced that anyone is doing it purposefully. I think they’re all doing it, to varying degrees, out of raw necessity, and the whole thing ties back to the evolution of the business model itself. For our case study, let’s use the only numbers I have available, which are mine from Medium. 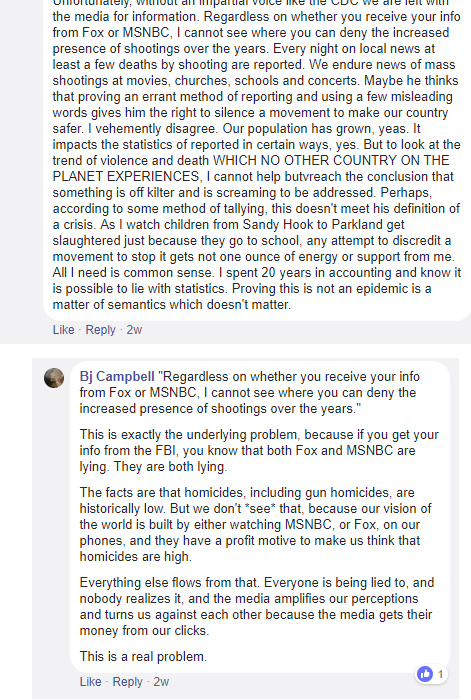 I posted my first gun policy article on Medium on March 13th of this year, mostly so I didn’t have to copy and paste the same argument repeatedly into the wall of culture-war gun threads I was swimming through on Facebook. It gave me an opportunity to really dig deeply into the numbers, and expose the vicious games of data manipulation I kept seeing over and over in the media. Didn’t think it would get big, but I threw it up onto a subreddit to see if anyone else was interested in reading it. Apparently, a few were. The first day this went up, I linked it to Reddit, on r/libertarian. I figured some of the folks there would find the article ideologically appealing. Then I popped some popcorn. A day later, other users had cross-posted it to r/skeptic, r/liberagunowners, r/firearms, r/conservative, and r/programming. Six days after that, r/bprogramming. Six days after that, r/TrueReddit, r/conspiracy, and the big one, r/The_Donald. Don’t blame me, I didn’t post it there. Watching the Medium statistical pages was fascinating. The article appeared on tumblr, on twitter, on a retired US Navy discussion forum, on java development forums, and even on a discussion website for Furries. 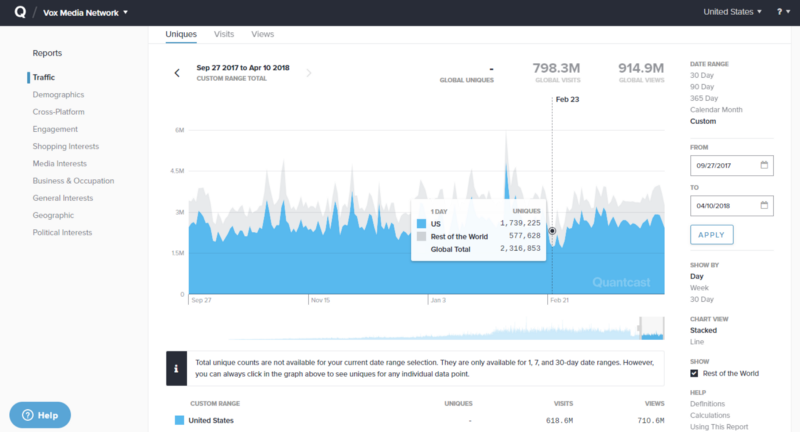 Every time it hit another high traffic location, the Facebook number would jump from secondary sharing for a few days after. It traveled through the sphere like vines through a shady yard, occasionally finding a patch of sun in which to flourish and branch out. Or like electrical impulses in a brain. 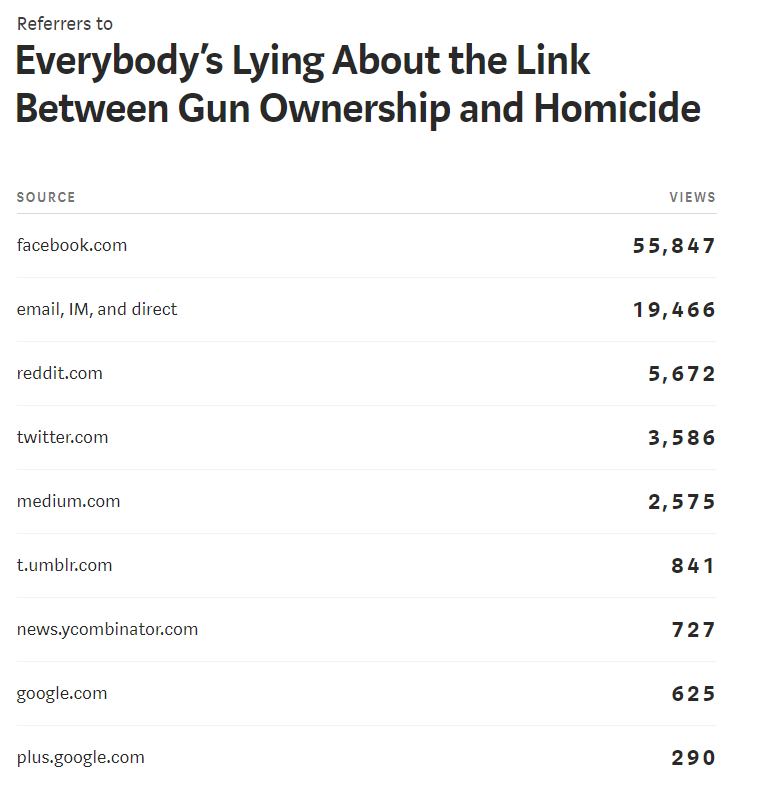 Please note at this juncture that the drive of the article, “so-and-so is lying about guns,” is very useful in the culture war, to certain people who have adopted a side in that war. I wrote some more articles, focused on looking deeply, and visualizing properly, the data behind gun violence in the USA. They did not attack conservative or liberal individuals, but many of them were very critical of the media, and much of that criticism was admittedly leveled against media elements who play to the left. I won’t bore you with details. The traffic the other articles received varied widely, and came from very different sources. No more Furries though. The best ones got almost no traffic at all. As I explored this, I landed on one conclusion. 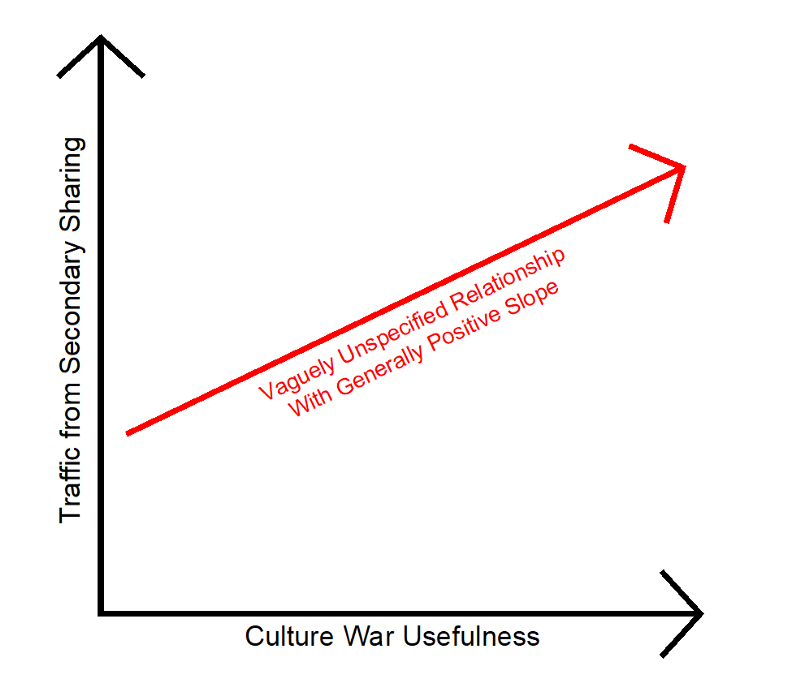 The more useful the article was for people currently in a culture war argument, the more secondary traffic it got, particularly from Facebook. What became crystal clear to me, as I watched the traffic around these things develop, is how many more clicks I could farm if I wanted to. I’m an entrepreneurial sort of guy. I own a business. I believe in market freedom. Thankfully I’m not some poor sap trying to make a living on Medium. If I really wanted traffic, the formula would not be to do what I was doing, which was building a case for a specific solution to solve a clearly identified problem. The formula would be to identify the highest traffic topic on Facebook, and feed those people what they want to hear. I would craft articles in two forms. After I’d written my hypothetical article about whatever the news cycle had chosen to be the crisis of the day, perhaps some 3 AM cocaine bender Trump tweet, I would load up my hypothetical farm of a dozen throw-away accounts on Reddit, (I don’t have one of these, I promise) I’d post the article in five places with five different accounts, and I’d use the throw-aways to upvote it systemically throughout the first two or three hours of it being posted. Then I’d laugh maniacally while I raked in the literal tens of dollars I’d earn through the Medium Partner Program. Might even be able to afford one reasonable bar tab at the end of the month. And what would that make me? My how things have changed, since George was on the scene. Everybody in every commercial media outlet today wakes up, takes a shower, drinks their coffee, and heads to work. And they spend their morning commute, and the time before it, and the time after it, thinking some variation of the same thought. “How am I going to get clicks today?” Folks running YouTube channels do the same thing. Facebook addicts do it too. Instagram. Everyone does it. 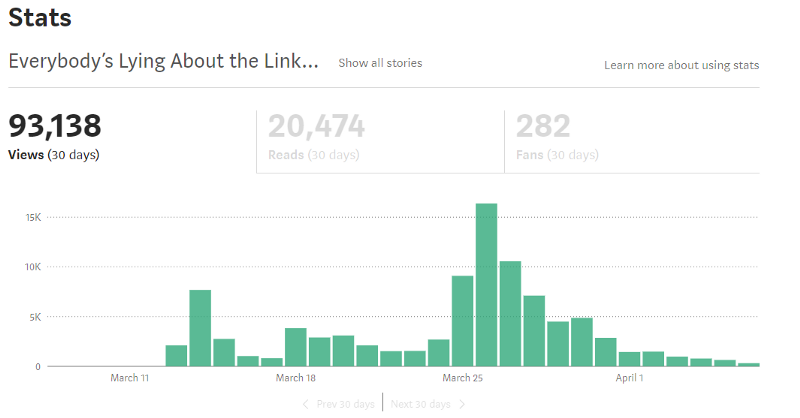 Hell, “how to get more traffic on your Medium articles” is one of the most worn out topics on Medium itself. How meta is that? This article is one of those “Evergreen” articles that bloggers talk about. It’s written in a way that the content won’t expire, and it will forever be relevant, so I’ll still be raking in the fractions of pennies years from now. Pull up the front page of Medium in a second tab, or CNN.com, or Fox News. Count the articles which are either culture war weapons for people to crosspost into Facebook arguments, or are signaling for people to throw on their own feed to out-virtue their friends list. Start watching for these things routinely. Use a wide lens. Make it your Zen Koan. “What is the sound of one finger clicking?” When I pull up Medium’s politics page, a lot of the material could be classified this way. And those authors will get their clicks and make a little money. This is not a critique of Medium. The Medium model is actually quite fabulous. This is a holistic critique on the entire thing, the combination of technology, markets, drivers, players, individuals, and consumers, who form a continuous gestalt of crazy. How much do you think Vox makes? 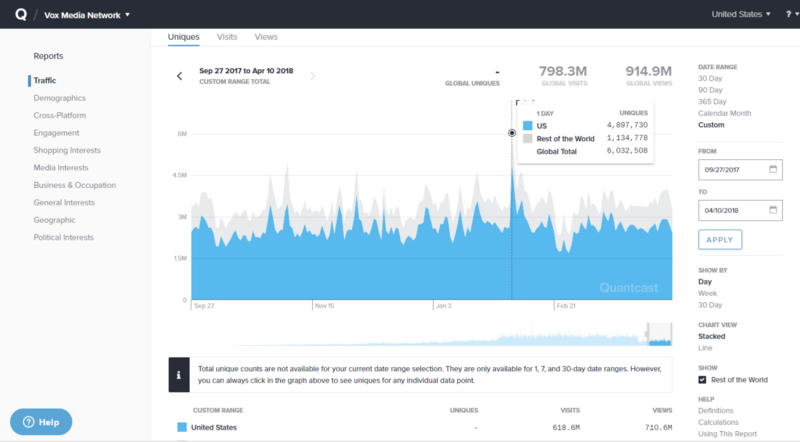 Vox has been kind enough to make their general traffic numbers public, and from that, we can back our way into some of their revenue numbers. In 2016, they got around 4.7 billion views, world-wide, and their gross revenue was around 100 million dollars. That would be two cents per view, which is over ten times what Medium’s paying me. That’s probably not a very reliable way to analyze it, though, because a lot of Vox’s earnings are piped through YouTube as Vox has shifted to video content. It’s all blended and crosslinked. That’s $120,650.16 of purely hypothetical gross earnings. God bless football. If we’re keeping track, that’s a 260% differential. These swings are money. The traffic incentive is palpable. In the strange and erudite fictional lore of Robert Anton Wilson, he speaks of a grand conspiracy of the Illuminati, whereupon the hidden masters of humanity brainwashed the clueless masses to feel emotions of anxiety, fear, and confusion whenever they see the word “Fnord” in text. They also aren’t able to consciously perceive the word, owing to the specifics of the brainwashing program. This allows anyone within the Illuminati to interject the word into news articles or commercials to prevent the brainwashed masses from evaluating the media content with reason. Be clear, this obviously isn’t real, nor is it original. It was a concept lifted from the Principia Discordia, a goofy religion parody document cooked up by some 1960s San Francisco hippies who were probably partaking of things a bit stronger than craft beer. But the concept is terrifyingly applicable to what’s happening now in the media, in a way that hearkens back to Ole George’s picture above. does this look familiar at all? Fnords perhaps? We have forgotten, as a culture, that the TV isn’t real. The media is using irrational emotions to manipulate people’s behavior. This isn’t new. It’s been used in marketing and advertising for almost a century. And when an advertisement does it, we know with 100% certainty that it is on purpose. We have been trained to watch for this. Many people think the media today is pushing these anxiety messages on purpose as well, to force a gun control agenda that is divorced from the facts. And some of that may be true. But the deeper I get into analyzing this this thing, the more I think there’s something wholly new and different going on. I think the media is pushing a lot of this purely because their new revenue modes are attached to anxiety. Creating anxiety is literally their job. It wouldn’t matter what sort of anxiety they create, as long as they create some, because anxiety generates traffic. That drives an evolutionary change in the business model itself. The current profit modes in media delivery reward anxiety mongers. To compete in the media marketplace, they must peddle anxiety or die. And that is far more terrifying to me than raw media bias. That is a system that will lead to chaos, as it feeds back onto itself, and it cannot be controlled. Guns are just one issue in an ocean of media behavior that exhibits these qualities. This media behavior crops up on every front, from the environment, to the Middle East, to healthcare. And violence has begun to erupt at the periphery of each of these issues, driven by the freakoutery. Take, for example, the barrage of messaging that Republicans were literally killing people with their Obamacare repeal attempts in June of 2017, prompting some nitwit to show up at a baseball field full of Republicans and start shooting them. Was he crazy, or was he simply fighting back? Both? His actions were not sane by any objective measure, but they may have seemed completely sane to him, given the world in which he lived, fed to him by his phone. Opinions of Obamacare aside, it should be clear that these sorts of violent boundary cases will multiply as the freakoutery expands. And they’re doing it for the clicks. Have you read “Thinking Fast and Slow” by Daniel Kahneman? The book is about decision making, and he talks about a lot of psychology studies. One particular idea he discusses is called “availability bias” where the more you see something, the more you believe it occurs more often. At the end he even talks about making policy decisions based on statistics or “what the public wants” and decides that the workable solution is to compromise, even though what the public wants often makes no logical sense. School shootings is a perfect example of availability bias. The news reports them often with 24/7 coverage, which leads people to believe that they happen “all the time.” Combine that with the feedback loop created by Facebook or places like Vox, and it never stops. Another example not mentioned in the book that I read about before is that people who watch horror movies all the time tend to be more fearful. So what’s the point? I certainly agree with your premise that media reporting is driven by clicks or views these days, and anxiety is an easy way to garner clicks. It’s called clickbait. For politicians is the same thing done for votes, control, and power? But how do we get people to realize that? I know smart people that don’t seem to care about reality and ignore potential biases that may be affecting them. I don’t bother arguing on Facebook or anywhere else because most people will never change.